As a child, Dr. Hallett knew several chiropractors and had seen people being adjusted, but he didn’t understand what it was all about. Someone mentioned how chiropractic could help him, but it wasn’t until years later that Dr. Hallett would discover the power of chiropractic. For years, Dr. Hallett had been interested in health, particularly in nutrition. When his beloved dog fell seriously ill, Dr. Hallett put his knowledge of nutrition to work. He monitored carefully everything the dog ate. A friend took notice and asked Dr. Hallett why he didn’t take the same good care of himself. His friend’s words resonated with him. So, when the same friend invited Dr. Hallett to come with him to the chiropractor, he readily agreed. Although he hadn’t seen the chiropractor for any particular condition, Dr. Hallett left feeling enlightened. He could think more clearly, noticed he wasn’t as susceptible to colds and sore throats, and felt a boost in his athletic performance at school. It was then that a light went on for him. Dr. Hallett had been working at a veterinary hospital and had plans of pursuing a career as a veterinarian. But the medical approach, where patients relied on the use of drugs and surgery to find relief, didn’t sit well with him. In contrast, chiropractic made sense and complemented his health care philosophy. His experience as a chiropractic patient had become something more; he now had a professional interest in chiropractic. A college friend of Dr. Hallett’s lived in Kansas City, which is home to Cleveland College of Chiropractic (now Cleveland University). Dr. Hallett liked the academic offerings at Cleveland, so he decided to apply and was accepted. He enrolled there, but after some time had realized the clinical aspect of his chiropractic training there was not what he wanted it to be. He transferred to Palmer College of Chiropractic for his final two years of training. After graduating from Palmer in 1984, Dr. Hallett sent letters of interest to chiropractors all over the country. A doctor from Waterford, Michigan, responded to the letter and called Dr. Hallett for an interview. One of the most attractive aspects for Dr. Hallett of his association with the doctor was that he would be returning home to Michigan. The two worked together for about a year before Dr. Hallett went on to work in Troy, Michigan and Toledo, Ohio, for the next 10 years. Ultimately, Dr. Hallett returned to Waterford to open Hallett Chiropractic, which has been serving patients for more than 20 years. 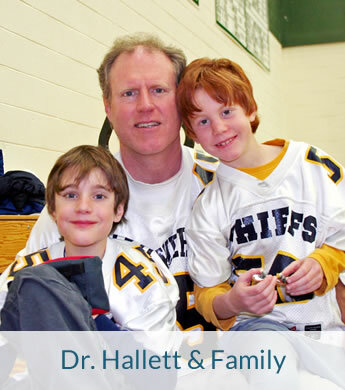 Dr. Hallett is board certified and has extensive training in nutrition, rehabilitation and sports medicine. Dr. Hallett and his wife are the proud parents of three active teenagers. The children participate in dance, cross country, track and swimming. The family also breeds and shows Irish Setters and currently have three Irish Setters at home. Dr. Hallett is still very much interested in giving his dogs the best care as well, and he regularly adjusts his dog Kelly and provides them with top-notch nutrition. You can follow their adventures at http://www.rollickinirishsetters.com/. Dr. Hallett also stays busy by serving as a precinct delegate for his voting district. The Halletts are also active in their church. Our patients are like family to us. We’d love to get to know you and see how your life can change through chiropractic. Contact our office today to get started!